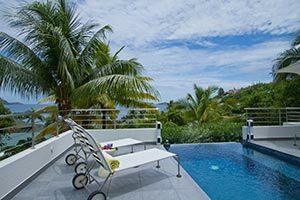 Villa UJV 211, also known as Villa Skrutten, is a three or four bedroom villa located just above the Christopher Hotel, in the popular area of Pointe Milou. The villa has a modern kitchen, with a dining area situated just outside. The modern living room is open to the pool area, and has comfortable sectional sofas. It also has an interior dining table. Two bedrooms are situated on either side of the living area. Each has a king bed and bathroom with shower. The third and fourth bedroom is situated on the lower level. It is set up as a small suite, with a separate living room, and a king bed in each of the adjacent rooms, as well as bathroom with shower. Outside is the lower deck, with separate seating and dining areas. This villa is ideal for two couples traveling together, or a family with children.